Traditionally Earl Grey was a blend of Chinese and Indian teas scented with oil from the citrus bergamot fruit – a sort of orange. 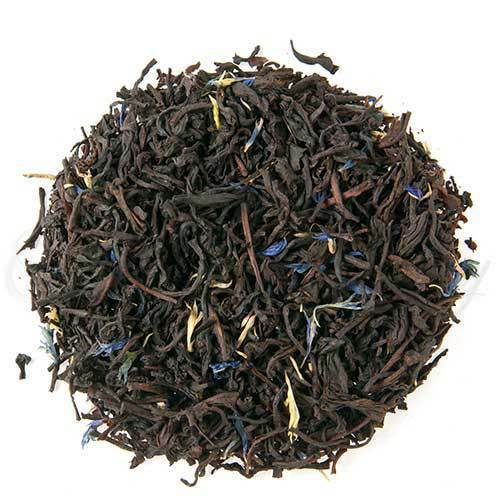 Stories about the origins of Earl Grey are numerous. One such tale tells how a British diplomat on a mission to China saved the life of a Mandarin. As a gift of gratitude, the diplomat was given the recipe for this flavored tea. Upon his return to Britain, the diplomat presented the tea to the Prime Minister of the day, Earl Grey. Another story says it was the Prime Minister himself who saved the Mandarin. In any event it was the Prime Minister of England (1830-1834) Earl Grey who made this tea fashionable. What type of tea do we use, how do we flavor the tea and why do we use natural flavors? Firstly… we only use high grown teas from the top 3 tea growing regions of Sri Lanka – Nuwara Eliya, Dimbula and Uva. These three high-grown districts produce flavorful teas that have classic „Ceylon‟ tea character which is noted by floral bouquet and flavor notes, touches of mild astringency, bright coppery color and, most importantly – perfect for use as the base tea of our flavored teas. (We have tested teas from various other origins around the world as base stock for our flavored teas, but none of these teas made the grade.) Dimbula and the western estates of Nuwara Eliya have a major quality peak during Jan/Feb, whereas Uva and the eastern estates of Nuwara Eliya have their peak in July/Aug. This „dual peak period‟ allow us to buy the best for our flavored tea blends several times during the year, ensuring top quality and freshness. Secondly… we use flavoring oils not crystals to give the tea drinker an olfactory holiday before indulging in a liquid tea treat. Thirdly… we specify natural flavors. High quality tea tastes good and natural flavors do not mask the natural taste of the high grown Ceylon tea. (The norm for many making flavored tea is to use overpowering artificial flavors, which can be used to hide lower quality tea). Natural flavors do not leave an aftertaste giving the tea a clean and true character. It should be noted that natural flavors tend to be somewhat „soft „ and the flavors slightly muted, but for many this is a refreshing change and one of the desired attributes of our naturally flavored teas. Hot tea brewing method: Bring filtered or freshly drawn cold water to a rolling boil. Place 1 slightly heaping teaspoon of loose tea, 1 tea bag or 1 Q3 portion pack for each 7-9oz/200-260ml of fluid volume in the teapot. Pour the boiling water into the teapot. Cover and let steep for 3-7 minutes according to taste (the longer the steeping time the stronger the tea). ANTIOXIDANT BENEFIT: More antioxidants are extracted from tea (L. Camellia Sinesis), or rooibos (Asphalatus Linearis), the longer it is brewed….and the more tea or rooibos that is used, the greater the antioxidant benefit. Visit our shop for luxury teas and specialty blends.